EDIT: Slightly edited the carbox and turned the shadow 180 degrees (it was upside down lol). EDIT 2: Huge improvement on the main texture thanks to Kiwi's hard work, who also provided a second, slighty different skin (in addition to the original one, which was relegated to a third option). ;) Also includes a new and improved hull file that should no longer get you on a trip on your very own space program. 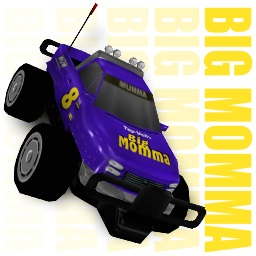 Remodeled BigVolt turned into Big Momma from RC Revenge Pro.